Waves is best-known for its line of high-end mixing and mastering effects plugins; Element is the company’s first venture into the world of software synthesizers. Waves Element is a virtual analogue synth, meaning that it uses a software model of actual synthesizer circuitry to generate sound. VA synths ideally allow you to have the best of both worlds: the character and depth of analogue sound, combined with the flexibility and easy integration of digital instruments. Waves Element sounds great. The synth’s virtual analogue modeling gives lead and bass sounds a deep richness and character, especially in the low and lower-mid-range frequencies. The single-page interface is intuitively laid out, meaning that anyone with a passing knowledge of subtractive synthesis can be creating their own sounds within a matter of minutes. The oscilloscope-like displays underneath Waves Element’s two main oscillators would be very useful to anyone learning synthesis: try turning up the “Pulse Width Modulation” knob on the second oscillator, then watching how different settings for the first oscillator affect the shape of the second waveform. The built-in arpeggiator/sequencer in Waves Element makes it easy to quickly try out different melodies, and its swing function has a nice rhythm to it. Waves Element’s CPU usage level is quite reasonable, even with “High Definition” mode switched on. 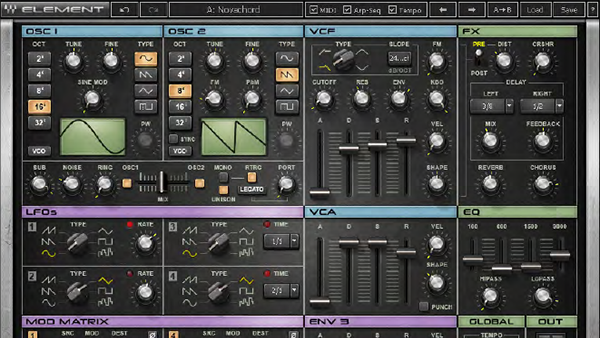 For a 21st-century synth, Waves Element offers a fairly limited amount of control over its sound. Of the four LFOs, for example, two are permanently locked to synchronize with the beat, and two are locked to free-running; they also lack phase, delay, and other commonly-found controls. The unison detune has no range setting: it’s either on or off. Additionally, compared to the synth’s rich lower frequencies, higher frequencies can sound a bit sunken and tinny. Waves Element only has six slots in its modulation matrix, which is fine for basic leads and basses, but limits the complexity of the sounds you can design. Somewhat surprisingly for a company that built its name on effects plugins, the onboard FX are kind of weak: the reverb unit, for example, only has one control (“Reverb”). The knobs and sliders could move more smoothly (although every control also supports keyboard entry if you want a precise value). All in all, Waves Element is nothing game-changing, but it’s a nice-sounding, useful instrument; its simplicity and relatively low price would make it a decent synth to learn subtractive synthesis on. Its limitations, however, mean that it’s unlikely to take over as anyone’s all-purpose go-to synth: it’s best-suited for making simple lead and bass patches, not for complex sound design.